Montreal is a city with no shortage of mid to high priced burger restaurants. Unfortunately many of them bad – and the cheap places tend to be a better bet. Perhaps the pressure of consumer expectation when paying more than $10 for a burger is just too much. Thankfully, ART:brgr (why no vowels?) actually delivers on the lofty promises of the $12 – $20 burger. The location is on Gilford street just off the corner of St Denis and the interior decor is random but charming. Notably a pool table lies at the north side of the restaurant and a bar in its center. We stopped by on a Saturday evening and were a little curious as to why it was empty. The restaurant is larger than we expected and there were only two other groups of diners when we stopped in. The menu consists of signature burgers, build your own burger and homemade hummus plates. I suppose the hummus plate is way of accommodating vegetarians? We ordered the Rojas Burger with lettuce, tomato, thin fried potatoes, jalapeno, cheddar cheese and a sunny side up egg with spicy home made aioli tomato sauce and the Steve McGarrett Burger with lettuce, spicy sweet chilli sauce [ house ], grilled pineapple, grilled onions and brie cheese. There are a couple of beers on tap including the usual St Ambroise as well as Carlsberg. The Rojas Burger was straight up delicious. The patty was thick and perfectly cooked. This is where a lot of these pricier burger restos fall flat – they get so caught up adding expensive ingredients that they forget to honor the patty. The sunny side up egg has the potential to create a messy situation but instead the yolk became your friend. It seeped into the meat and added genuine flavor to the condiments. The Steve McGarrett Burger was doing something more unconventional with the grilled pineapple and I dare say it could have been gimmicky. It was saved by a shrewd pairing of brie cheese and grilled onions. The soft cheese tones down the fruitiness of the pineapple and allows for the meat and chili sauce to come through. Both the burgers were extremely filling and came with fries and salad. I was relieved at the portion size of the fries because a lot of burger places go overboard with it. The fries were thick and crispy – very tasty. I also like not having to choose between fries and salad but I guess that is one of the amenities of paying $13 for a burger plate. Overall, we enjoyed our burgers and they lived up to the $13 price tag. There are some burgers on the menu that flirt with the $20 range so whether those ones are worth it we can’t say just yet. If you do end up going let us know in the comments! 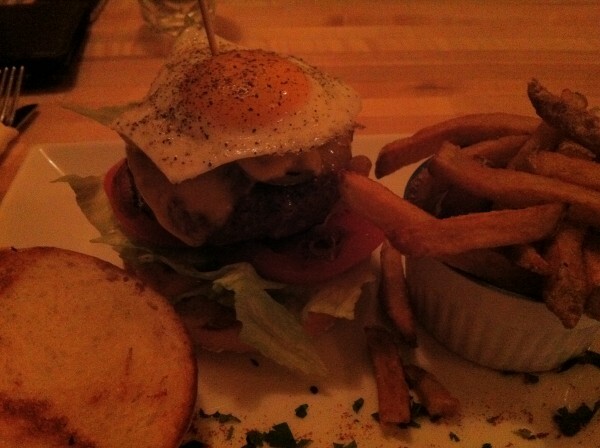 Tags: Beef, Beer, Burger, Egg, forkandtell, Fries, Montreal, Pineapple, St. Denis.